Brandon Holiday Home is a delightful, detached cottage set in a rural location, close to the village of Cloghane, County Kerry. Boasting three bedrooms comprising of one double, one twin and one family room with en-suite facilities, as well as one family bathroom and a ground floor wetroom, this cottage can sleep up to seven people. The cottage also contains an open plan living area with kitchen, dining area and sitting area with a multi-fuel stove. Fuel and power charged by meter reading. There is a separate sitting room featuring an open fire and sliding doors that lead to a large, rear garden with furniture and barbecue; to the front of this cottage there is off road parking available for 2 cars. Located in wonderful countryside and yet just five minutes' walk to the beach, Brandon Holiday Home is a fantastic cottage in a beautiful part of Ireland. 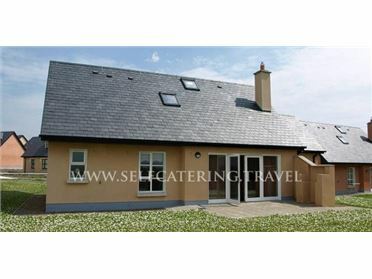 The rural coastal village of Cloghane is situated on the northern tip of the beautiful Dingle Peninsula, and features stunning scenery and panoramic views of both the countryside and the sea. Home to the majestic Mount Brandon, walking and hiking lovers are well catered for in this small village, while everyone can enjoy the delights of the seaside at the many local beaches. With the whole of the Dingle Peninsula on the doorstep, and the rest of County Kerry and Ireland beyond, this is a fantastic location for an Irish holiday.